The German Literature Month, a favourite bloggy event! We are closing in on the end of November and I have only finished my first read. I stumbled upon it in the Linguistics section of the campus library and would highly recommend it to those interested in this chapter of history, language, etymology and philology. I don't think familiarity with the German language is requisite. 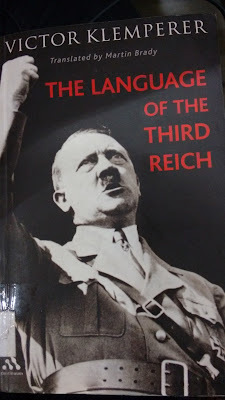 The Language of The Third Reich is part memoir, part compilation of diary entries, very insightful and wholly absorbing. About the book: The Language of The Third Reich is a book by Victor Klemperer, who after serving in the First World War, worked as a professor of Romance Studies at the Dresden University of Technology. "Under the Third Reich, the official language of Nazism came to be used as a political tool. The existing social culture was manipulated and subverted as the German people had their ethical values and their thoughts about politics, history and daily life recast in a new language. Originally called LTI – Lingua Tertii Imperii: Notizbuch eines Philologen, the abbreviation itself a parody of 'Nazified' language, the book was written out of the conviction that the language of the Third Reich also helped to create its culture. The book is translated by Martin Brady, a film historian and artist." My thoughts: Klemperer dedicates this book to his wife, and the crisp dedication ascertains the tone of the book - sincere, heartfelt, with the humourless smile of a survivor. He starts with the word heroic and its nazifierte meaning, how for a whole generation of Germans heroism wears a soldier's uniform. The LTI, as Klemperer calls it, breeds military-worship. Heavily romanticized words like heldenhaft (valient) and kämpferisch (gladiatorial) replace the more accurate and narrow kriegerisch (warlike.) Over and over he ironically quotes Schiller, calling the LTI a language that thinks and writes for you. A poison you inadvertently unthinkingly drink, that runs through your being. In a chapter titled The Star, Klemperer states how from all the suffering in the twelve years of hell, the single worst day for the Jews was 19 September 1941, when it was made compulsory to wear the Jewish star. Over the following chapters, The Jewish War, The Jewish Spectacles and The language of the victor, Klemperer describes with growing despair how the LTI enters the speech of those who on the face of it don't support the Nazis and even the Jews, how no one escapes the constant venom that has no antidote. None of them were Nazis, but they were all poisoned." Kemperer calls the Nazified German a language of faith. He reflects on how, in those days, people would express not a leidenschaftlichen (passionate) belief in things but a fanatischen (fanatic) as if fanaticism were a pleasant mix of courage and loyalty. In I believe in him, one of the best chapters of the book, he notes speeches where Hitler calls himself the German saviour, demanding this exalted status from his followers. Excessively used in the National Socialist vocabulary are words that radiate an aura of permanence, like einmalig (unique,) historisch (historic) and ewig (eternal). It is as if the Third Reich were not only unprecedented but infallible, even holy. Klemperer says, "Nazism was accepted by millions as gospel because it appropriated the language of the gospel." And then he talks about the people, the cult of followers. The prefix 'Volk-' enters the LTI vocabulary - Volksfest, Volksgemeinschaft, Volksseele, the people's festival, the people's community, the people's soul and even today we still have the people's car. Klemperer talks about the Nazi leadership herding its followers like cattle. Every message must be simplified and the bold underlined golden rule is not to let the Volk think critically. One direct consequence of this is the introduction of foreign terms into the language. An impressive defamieren (to defame) kicks out the German schlechtmachen (to run down.) The LTI prefers using Terror and Invasion to their German equivalents. Foreign words are scarier, they stupefy and drown out thought. In the beginning, Klemperer's diary entries bleed a steady against-all-odds optimism, soon a weary hope and finally you find him clinging on to his intellectual instinct as some form of strict self-preservation. Through the book, he attempts to trace the roots of Nazism, muses on his experiences in the First War, on patriotism, fascism, Zionism, race, identity and ideas that were once exotic and largely impersonal. He mentions how as a boy the term 'concentration camp' sounded colonial to him, utterly un-German, and wonders whether it will now forever be associated with Hitler's regime. Is hardly worth a word at all. Your ship has bridged the ocean. Do you yearn for Europe's shore? For Europe is a notion! This is a great post Priya. The books sounds fascinating. It seems that all organizations and movements develop their own language or preferred words and terms.Totalitarian regimes seem to integrate such language into the daily life of their citizens in way that say a lot about them. This is something that George Orwell was interested in and was the basis for his invention of Newspeak in Nineteen Eight Four. The term, Concentration Camp, which really did have a different meaning before the Nazi's, has indeed been forever changed. Thank you, Brian. Yes, the prediction he made all those years ago was right, I never knew that the concept of concentration camps did not have a German origin. I love 1984 and the idea of Newspeak. This was like reading actual historical evidence for that. The dumbing down of speeches for the masses and the simplistic slogans Klemperer mentions even reminded me of the sheep chants from Animal Farm. But I'm sure, as you said, this must be a character of every totalitarian regime. Wow. This sounds a lot like brainwashing. It's a little creepy how things have endured, like the Volk. I was thinking about the car, too.